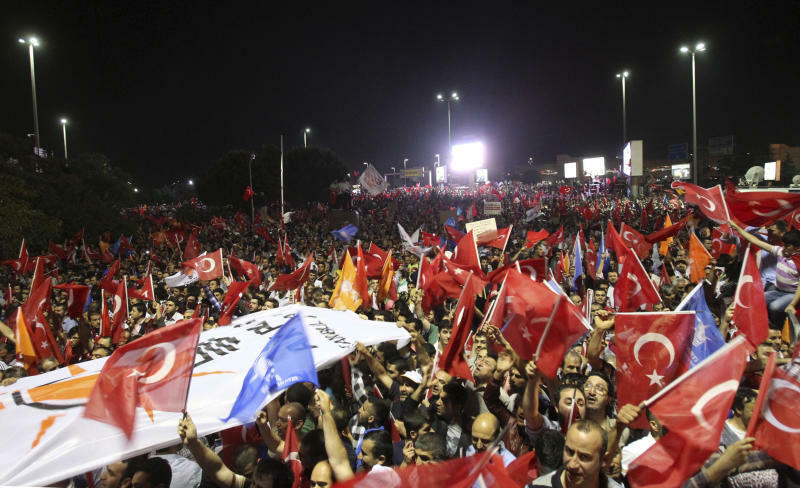 ISTANBUL (AP) — Turkey's prime minister took a combative stance on his closely watched return to the country early Friday, telling supporters who thronged to greet him that the protests that have swept the country must come to an end. In the first extensive public show of support since anti-government protests erupted last week, more than 10,000 supporters cheered Recep Tayyip Erdogan with rapturous applause outside Istanbul's international airport. Despite earlier comments that suggested he could be softening his stand, Erdogan delivered a fiery speech on his return from a four-day trip to North Africa. "These protests that are bordering on illegality must come to an end as of now," he said. Tens of thousands of protesters have held demonstrations that have spread to dozens of cities across Turkey, sparked by the violent police reaction last Friday to what started out as a small protest against a plan to develop Istanbul's central Taksim Square. Since then, three people have died — two protesters and a policeman — and thousands have been wounded. One protester is on life support in a hospital in Ankara. Protesters from all walks of life have occupied the square and its park, objecting to what they say is Erdogan's increasingly autocratic and arrogant manner — charges he vehemently denies. Turks have been awaiting Erdogan's words upon his return, seeing them as a signal of whether the demonstrations would fizzle or rage on. Erdogan at times was almost drowned out by his supporters, part of the base that has helped him win three landslide elections. "God is Great," they chanted, and soon moved on to slogans referring specifically to the protesters in Taksim Square. "Let us go, let us smash them," they shouted. "Istanbul is here, where are the looters?" Erdogan had initially referred to the protesters as looters and troublemakers, while also acknowledging that excessive police force might have been used, and promising it would be investigated. 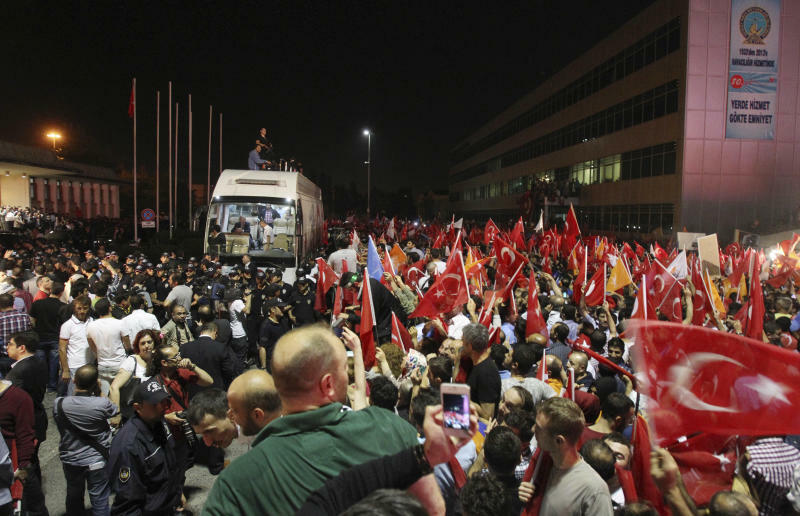 Erdogan's speech, delivered from atop an open-air bus outside the airport terminal, appeared at first to be an attempt to strike a unifying note. "They say I am the prime minister of only 50 percent. It's not true. We have served the whole of the 76 million from the east to the west," he said, referring to his election win in 2011, when he took 50 percent of the vote. "Together we are Turkey. Together we are brothers," he said, adding "We have never endeavored to break hearts. We are in favor of mending hearts." But he soon became more combative. "We have never been for building tension and polarization. But we cannot applaud brutality," he said. In his last speech in Tunisia before flying to Istanbul, Erdogan had said that terrorist groups were involved in the protests, saying they had been identified. In a twist, Erdogan implied that bankers were also part of a conspiracy that was fuelling the protests. He added that the flames of dissent had been fanned by other groups too. "Those who call themselves journalists, artists, politicians, have, in a very irresponsible way, opened the way for hatred, discrimination and provocation," he said. Speaking before Erdogan's return, Koray Caliskan, professor of political science and international relations at Bosporus University, pointed out that the prime minister was maintaining a hard line because "until now Erdogan had always gained support by increasing the tension in the country." 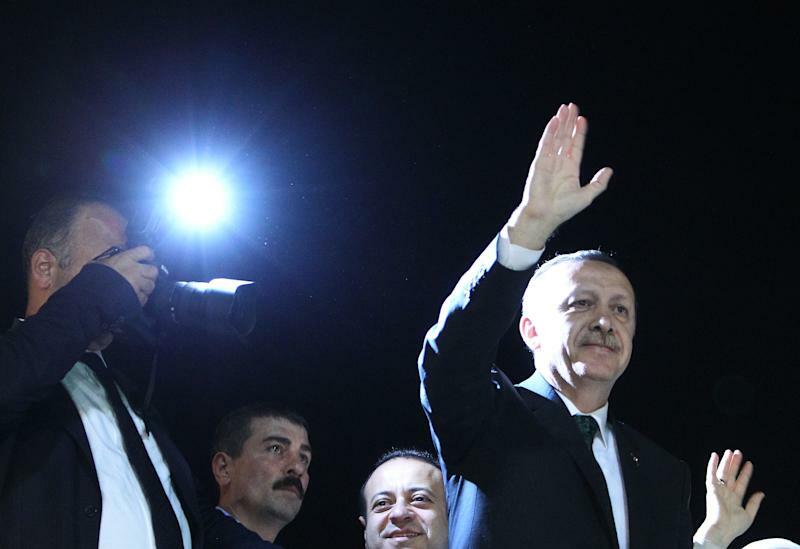 "Turkey is absolutely at a crossroads. Erdogan won't be able to point at Turkey as a model of democracy anymore," he said. In his earlier comments in Tunisia, Erdogan acknowledged that some Turks were involved in the protests out of environmental concerns, and said he had "love and respect" for them. Those comments don't appear to have swayed many of the thousands of protesters who thronged the square for a sixth day Thursday. More than 10,000 others filled a busy street in a middle class area of Ankara. "I do not believe his sincerity," said protester Hazer Berk Buyukturca. Turkey's main stock market revealed the fears that Erdogan's comments would do little to defuse the protesters, with the general price index plunging by 8 percent after his comments on concerns that continuing unrest would hit the country's economy. Over the past week the demonstrations have spread to 78 cities, growing into public venting of what protesters perceive to be Erdogan's increasing arrogance. That includes attempts to impose what many say are restrictive mores on their personal lives, such as how many children to have or whether to drink alcohol. So far, 4,300 people have been hurt or sought medical attention for the effects of tear gas during the protests, the Turkish Human Rights Foundation said. One person is on life support in Ankara. Interior Minister Muammer Guler said more than 500 police officers had been injured. A total of 746 protests had erupted, causing some 70 million Turkish Lira ($37 million) in damages, he said. Nearly 80 protesters were still hospitalized, and almost all detained protesters had been released. Fraser reported from Ankara. Ezgi Akin in Ankara contributed.